A few months ago I stumbled over a brief newspaper article on a new mobile document checking device. I gathered more information at the manufacturer’s website and then contacted the company asking for more details. Today this device is on the brink to serial production. A few days ago I got a 3D-printed test device (pre-production) named DOCULUS LUMUS. The name comes from Doc = Document, Oculus = Eye & Lumus = Light. My first impression when I unpacked the device was, it really comes handy and with a weight of only 100g it will comfortably fit in your pocket. Dimensions are L: 10cm W: 6cm H: 3cm. Two AAA batteries are needed to operate. DOCULUS LUMUS was invented to test passports, ID cards and banknotes. 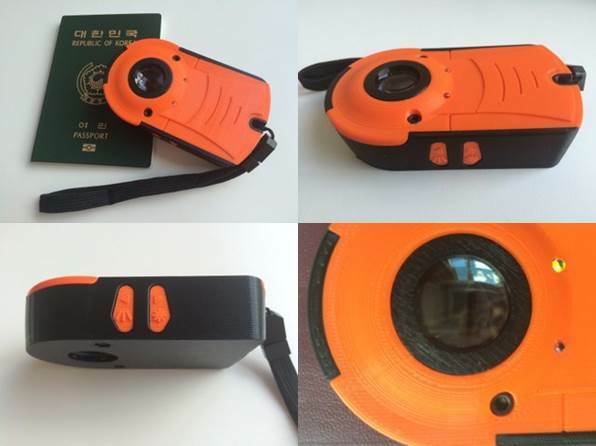 A core focus in the development was to consider the need and wishes of experts which will use such a mobile device on the spot like police, border control, or bank staff. 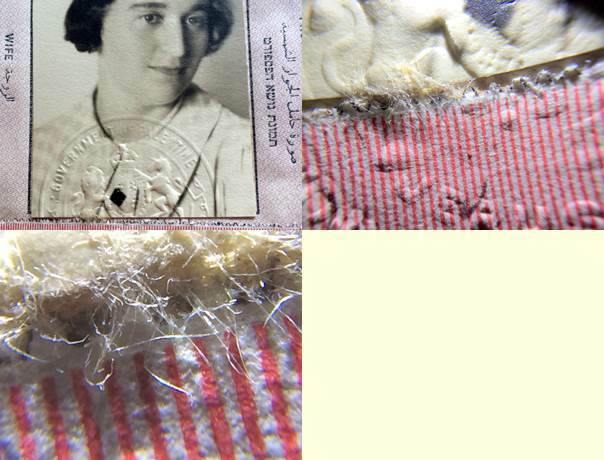 But also for me as collector and expert of historical passports such a device might be very useful to detect imperfections, alternations and forgeries. You are the expert! Doculus Lumus helps you to check travel documents, driving licenses, banknotes, signatures and similar for authenticity, whether you are in a train, a car, a plane or even on the countryside. Different light modes reveal the security features very well. With the RFID transponder check you can verify all currently used passport transponders for correct response. I tested the device with the following functions on historical and modern obsolete passports from my collection and asked friends for a test with their current biometric passports to perform also the RFID Transponder Check. Later test was made on the following nine passport models: Italy 2012, China 2012, Germany 2011, Korea 2010, Macao 2010, Hungary 2009, Thailand 2009, USA 2008 and France 2006. 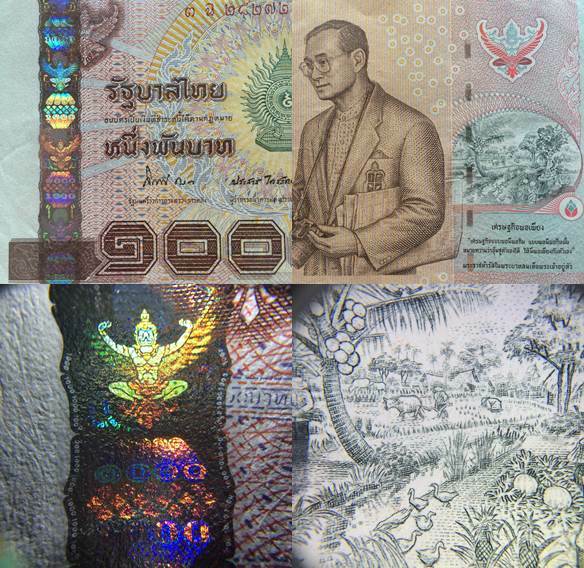 The banknote is a 1000 THB Thai note. All photos made with an iPhone 5s. 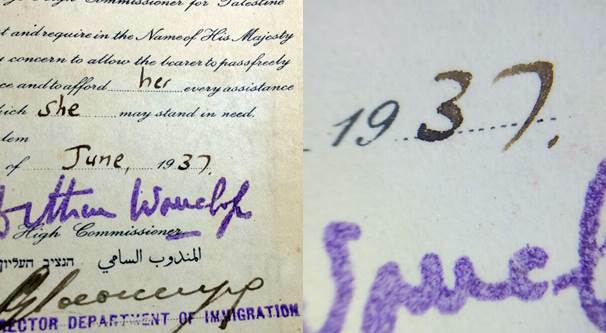 British Palestine Passport 1937. The digital zoom of any camera does allow you a even bigger magnification. Incident light with 4 strong LEDs (bright field illumination) allows to check even the finest printed details like microtext or nanotext. 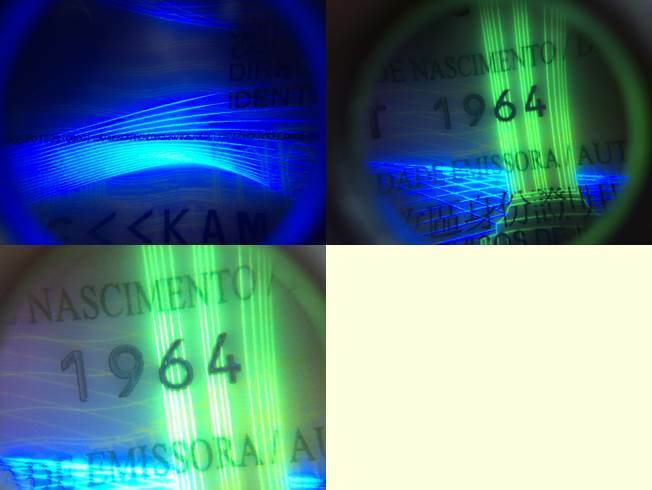 The UV light mode with its 4 strong UV LEDs (365 nm) allows an optimal depiction of UV security inks through the lens as well as from the side from short distance. Also deviations / observation e.g. in handwriting (signature) are visible by UV Light. The use of ultraviolet or infrared light sources may visualise erased ink, particularly if the ink has been erased using a chemical solvent. The oblique light mode allows you to identify intaglios, embossing, color changing kinegrams or holograms. With the aid of 8 LEDs that successively shine on the document in 45° steps, shadows are created at heightened or deepened features (dark field illumination). Color changing elements look different depending on the angle of light incidence. In certain situations, e.g. at bright sunshine, the normal incident light mode may be too dark. You will need a higher light intensity to shine through water marks as well. The torchlight mode allows an optimal illumination even in a very bright surrounding. 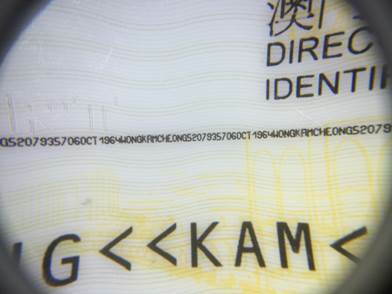 The RFID transponder check allows verifying of the transponders that are integrated in passports or ID cards. Therefore you can check authenticity, proper function and transponder type in a very short time. Please keep in mind that in some passports a shielding prevents reading from outside. Just open the document to check it from the inside. Oblique light mode: After you activated the steady light function for oblique light, you can use the left and right arrow buttons as usual to change the illumination angle. Torchlight mode: Press incident light or UV light button and click the other button next to it 3 times rapidly. The red LED blinks 3 times slowly after releasing a button if battery is low. Plan to change batteries soon and carry a set of replacement batteries with you. If the energy in the batteries is too low for proper function of the device, the red LED starts to blink at a button press. If some button is pressed inadvertently (e.g. in a case) or the steady light function has been activated, the device turns off after 1 minute to prevent the batteries from being drowned. My focus was to elaborate if such a device is useful for collectors of historical documents (in my case old passports & related travel documents). I do consult museums, foundations and collectors so some tools are needed to verify a document is genuine, not altered or forged. By today I use different tools to perform such tests. Inspecting historical documents on the spot (e.g. at collectors fairs) with DOCULUS LUMUS will give me much more freedom & confidence as I have all core functions in one handy mobile device to verify documents quickly. The 15x magnification with bright light LEDs is just the perfect magnification to see all details. The different light modes make it easily possible to detect deviations or variations in a document or signature. A RFID Transponder Check is of course not necessary for my purpose (even when tested as described) but all other functions are most welcome. The lack of water resistance might be an issue for users like police or border control if using the device outside but as mentioned there is an optional splash water case available. In my opinion the device is absolutely useful for collectors of items like documents, stamps, revenues and banknotes. For private collectors the price of 249€ might be not inexpensive (depending on the price level of the documents you collect). For organizations like police & border protection it’s a very reasonable investment, especially compared to other devices on the market. you can scan the document with scanner on 1200 dpi and you get a microscope like look on the details of the document.